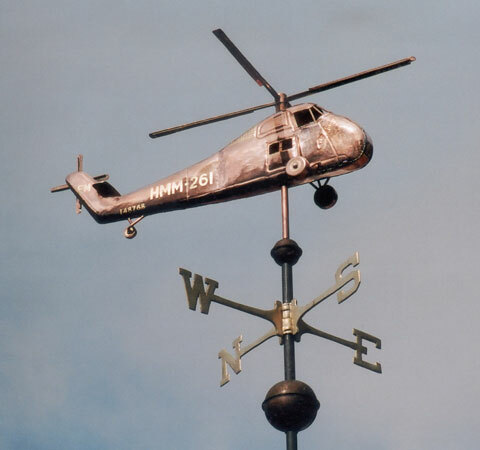 Our Sikorsky UH-34D Weather Vane was first commissioned as a birthday gift by the family of a man who flew a Sikorsky Helicopter while serving in Viet Nam. 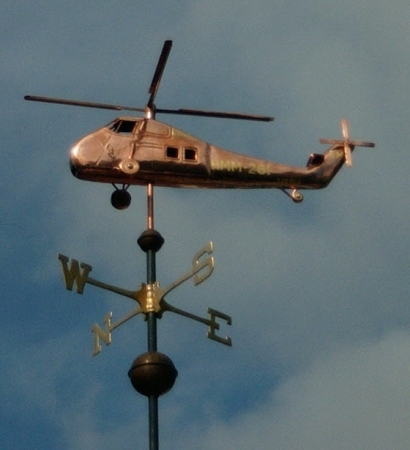 In addition to gold leafing the helicopter’s call number on the aircraft (included in the price of the weathervane) they selected optional gold leafing to detail some of the insignia and decals from that war-time craft. The helicopter he flew is now on display at the Smithsonian Air and Space Museum. The helicopter arrived today. Fantastic job! It turned out better than I could have expected. Thank everyone involved on this great piece of artwork. It is almost too nice to put outside on the garage roof. Patty was really impressed with the quality of workmanship. Thank you for a job well done. The version shown here was fabricated entirely of copper. We can also include brass, optional nickel silver, gold and/or palladium leaf to provide more variety in coloration, if that is your preference. West Coast Weather Vanes specializes in custom copper weathervanes. 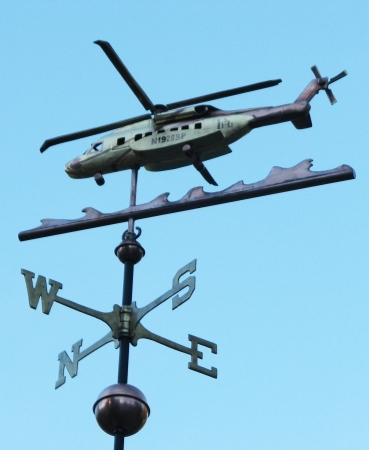 The Sikorsky helicopter commission resulted from our customer seeing the MD 500E Helicopter Weathervane on our website. 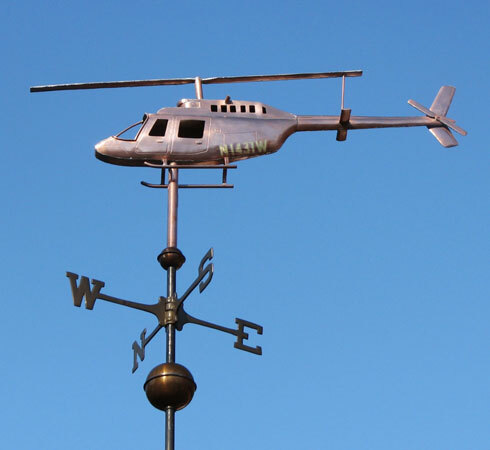 If you would like us to design and fabricate a custom helicopter weathervane for you, please give us a call. It is always a pleasure to discuss new weathervane projects. We are often able to reduce the design fee for our mechanical weathervane commissions if detailed schematic drawings are available. For personalizing it is also helpful to have detailed photos of the actual aircraft, including photos of insignia, detailing, interiors, etc. Often overlooked are detailed photos of the underside of the aircraft; an important view when looking up at a weathervane! If actual scaled down models are available, we often find them helpful guides during the construction process. Sikorsky Aircraft Corporation was founded in 1925 by aircraft engineer Igor Sikorsky, a Kiev-born American immigrant. The company began aircraft production in Roosevelt, New York that year. In 1929 the company moved to Stratford, Connecticut. After a sales decline in the late 1930s, he took this opportunity to begin work developing a practical helicopter. In 1942, the Sikorsky R-4 was the first stable, single-rotor, fully controllable helicopter to enter large full-scale production. The majority of subsequent helicopters are based on its design.